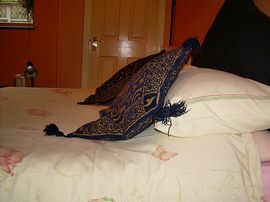 Although we are close to City Centre we are in a quiet location. 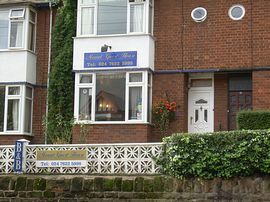 A warm welcome awaits you at our family-run guest house, situated in the heart of Coventry. We're within walking distance of the City Centre and all of its attractions such as Cathedrals, Sports Centre and the Sky Dome complex, which houses a skating rink, themed pubs, restaurants and a 12 screen cinema. 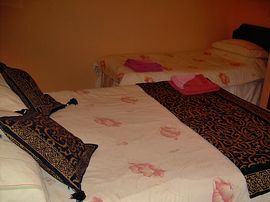 All rooms have TV and tea coffee making facilities. From our Guest House you can easily get to the NEC - in fact by car it only takes 10 minutes as we are close to A45. Alternatively you can go by bus, which is within walking distance - 20 minute walk if going by train. The NEC is approx 5/6 miles away. Of course we are central to visiting our many nearby tourist attractions such as Stratford, Warwick, Kenilworth and Leamington Spa. There is a bus service right outside the guest house to go to the Ricoh Arena. We welcome a variety of clientele ranging from Contractors working in and around the City to students, tourists and business people. From £22 per person sharing rate, for Bed and full English breakfast. Open all year round, but with room only over Christmas (at reduced rate to reflect this). Special Diets Provision: Special diets are catered for. Anything with prior notice except halal meat. Disabled Facilities: There are no disabled facilities. Obviously it depends on what particular disability. Unfortunately because we are situated on an embankment wheel chair access is extremely difficult. Approach Coventry from whichever direction heading for the City Centre. Around the City Centre is a Ring Road (approx 2 miles long). Get onto this Ring Road and follow signs for Birmingham (junction 8). When you come off at this junction keep in the right hand lane in order to turn right at first set of traffic lights into Barras Lane. Follow Barras Lane and it will take you sharp left into Coundon Road where we are situated. Look immediately to your left for the Bus Stop because we are on the embankment behind it. Park on single yellows and access our house via the slope just beyond Bus Stop. From Birmingham 900 and it stop outside the Aston Court Hotel (Swallow Group) which is in parallel road to us. Take a taxi at minimum fare as we are only a short distance away.